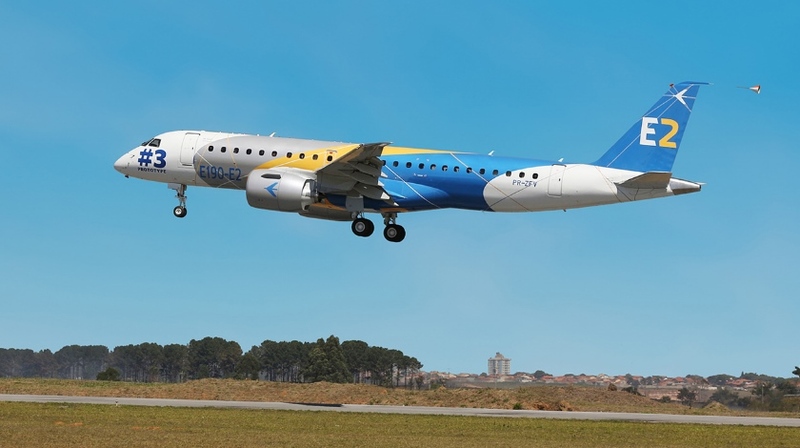 The third of four Embraer E190-E2 flight test aircraft has flown for the first time, the Brazilian manufacturer confirmed. The flight test program for the next-generation E-Jet powered by Pratt & Whitney PW1900G geared turbofan (GTF) engines was launched ahead of schedule May 23. The second E2 prototype took to the skies July 8. The third flight test aircraft, which flew its initial flight Aug. 27 from São José dos Campos, Brazil, “will be used primarily to test flying qualities and evaluate how the aircraft handles in icing conditions,” Embraer said in a statement. The first E190-E2 flight test aircraft is in the midst of conducting tests on systems, loads, aero-elasticity, external noise and crosswind handling, Embraer said. The second E190-E2 is being used to test systems and general aircraft performance. The first two E190-E2 flight test aircraft have accumulated 150 flight hours so far, according to Embraer. The fourth E190-E2 will join flight testing “by early next year,” Embraer said. That aircraft will have a full-cabin interior and be used to measure passenger comfort and internal noise levels, Embraer said. The E190-E2 remains on track to enter service in the first half of 2018, according to the manufacturer.